1. Preheat the oven to 200ºC, gas mark 6. Place the coley at one end of a large baking tray and sprinkle with herbs. Place the squash at the other end of the tray. Bake for 30 minutes. 2. Meanwhile, cook the cabbage in boiling water for 3–4 minutes until tender, then drain. 3. 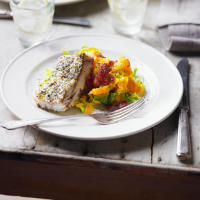 Dry fry the bacon for 4–5 minutes, stir in the squash and mash, stir in the cabbage and serve with the coley.